Rack Diagram is a graphic representation of a rack system, often used as a server and designed to be installed in a framework. A rack diagram is a metal frame used to hold various hardware devices such as servers, Router, Raid, UPS, hard disk drives, modems and other electronic equipment. The rack equipments templates include specialized serial devices, router, ups, bridge, monitor, rack, raid, tape drive, switches, and lots of new devices for use in diagramming your rack environments. The following figure represents a part of rack diagram symbols which are designed to fit together precisely, and their connection points make them easy to size and snap into place. After they are connected, they remain together, even when you move them. You can store data with the rack equipment, such as serial number, IP address, device role, equipment information and location. After you've associated data with the symbols, you can generate detailed reports. 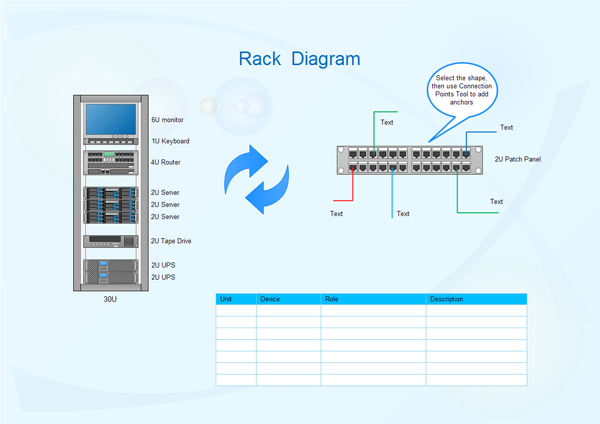 The rack diagram below shows the equipments in a data centre for creating device and server diagrams.